Most of the wartime palms have been cut down , which was a bit of a shame for comparison photos. 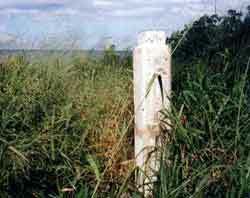 There is an American memorial pillar near the beach, but the plaque had been ripped off. I am told this marks the MG position where Marine Al Schmidt won the Navy Cross? 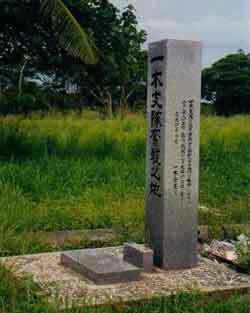 On the east bank (Japanese side) there is a Japanese memorial to the soldiers of the Ichiki Force. 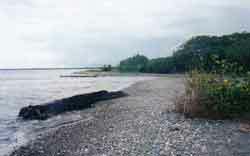 In 1996 we found a single US barbed wire stake lying on the beach , totally encrusted . When we tried to chip the coral off the stake it broke in half - totally rusted through and carbonised . But still stuck to the side of it was a partially burnt 37mm shell propellant charge from a (slightly damp?) 37mm round fired by a Marine AT gun or Stuart light tank so long ago – a frozen moment - my first and favourite Guadalcanal souvenir! In March 1996 a friend visited the site briefly and found a few Japanese bottles in the bushes on the east bank and a single .303 round on the west bank . This round was made at the Maribyrnong Ordnance Factory here in Melbourne - actually just across the river from where I live. I wonder how it got there to the Ilu River ? I have read that the Americans found numerous captured Allied rifles being used by the Japanese on Guadalcanal and supplies of Jap loaded .303 ammunition - maybe this round was from Australian stocks captured in Malaya? Perhaps it was from the rifle of a native scout – who knows? To the right of the trail on the west bank, just along the river line, is a large area where they seem to have buried all the aircraft bits and pieces. There were metal remains everywhere: mountings for radial engines, pieces of wing, aircraft parts, pieces of wing, propellers, rusted lids of 37mm ammo cans, etc. In 1995 we found some US pilot armour from the back of the cockpit and gave it to the museum. Very sweaty and full of mosquitos here. Unfortunately all this stuff is buried where the August 1942 positions would have been. "Ichiki Party" was organized in Ashikawn, Japan. 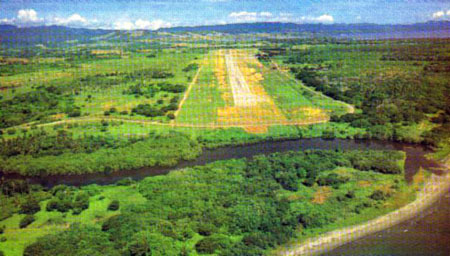 They landed on this land in August, 1942 and most of them were to die in fierce battle. We priase the soldiers of Ichiki and those of all nations who died here, for their nation. It is our sincerest wish that the world will remain peacful, forever without anymore wars.